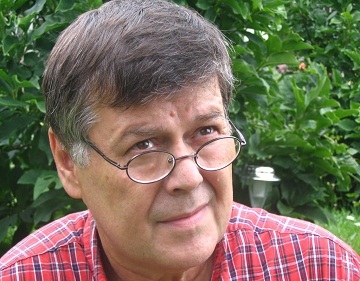 Marjan Šijanec was born in April 1950 in Maribor, Slovenia. He graduated from the University of Ljubljana in the Academy of Music, department of Composition. Later he followed a specialist course in electronic music at the electronic studio of Radio Belgrade, as well as a computer programming course (C – language and UNIX system) at the Institute for Nuclear Physics in Vinča. Šijanec’s compositions could be described as postmodern, belonging to the »information era«. The composer is among the first to create computer music in the territory of the former Yugoslavia. He developed special algorithmic music and is the author of a unique technique in composition which is based on integral serialism of magic squares. Šijanec’s projects have come to life both in Slovenia and abroad (International Festival of Contemporary Music – MBZ, Zagreb; Bemus, Belgrade; Annual Review of Yugoslav Music, Opatija (1984 – 1988); Festival of Experimental Music, Bourges, France; Slovene Days of Music, International festival Unicum, 61. Ljubljana Festival, Ljubljana, Slovenia; Prix Ars Electronica, Linz, Austria; Auroville Film Festival 2009 and 2011, Tamil Nadu, India; Florence International Choir Festival, Florence, Italy 2012; XIII Festival Internacional de Muzica de Sabadell, Spain 2012; Fukushima Vocal Ensemble Competition, Japan 2013; America Cantat VII, Columbia; Choirs Festival “Enlance coral”, Guatemala City, Guatemala; “Camarissima” International Festival and Cultural Diversity Festival, Mexico City, Pachuca, Hildalgo, Mexico; ICOM/MPR/AVICOM 2013, Rio de Janeiro, Brazil; International Festival, Theatre Confrontations, Lubin, Poland 2013; Zuiwerings hal west, Holland Festival, Amsterdam, Netherlands 2013; Orangerie, Kunstfestspiele Herrenhauser, Hannover, Germany 2013; Halles de Schaerbeek, Kunstfestival Brüssel, 2013; Belgium, 2013; Grand Theatre de la Ville de Luxembourg, Luxemburg 2013; Art center, Melburne Festival, Australia 2014; Kaserne Basel, Reithhale, Switzerland 2014; World Music Days, Slovenia 2015. . . ). He has received numerous awards for his work. Rojen aprila 1950 v Mariboru, Slovenija. Diplomiral iz kompozicije na Univerzi v Ljubljani, Akademija za glasbo, Oddelek za kompozicijo. Specializacija iz elektronske glasbe v elektronskem studiu Radia Beograd ter iz računalniškega programiranja (C – language in UNIX sistem) na Inštitutu za Nuklearno fiziko Vinča. Šijančeva glasba se lahko okarakterizira kot post-moderna, pripadajoča “informacijski dobi”. Skladatelj spada med začetnike računalniške glasbe v nekdanji Jugoslaviji. Razvil je posebno algoritmično glasbo, ki se manifestira v svojevrstni kompozicijski tehniki – temelji na integralnem serializmu magičnih kvadratov. Svoje projekte realizira doma in v tujini (Mednarodni festival sodobne glasbe – MBZ, Zagreb, Hrvaška; Bemus, Beograd, Srbija; Jugoslovanska glasbena tribuna, Opatija, Hrvaška (1984 – 1988); Festival eksperimentalne glasbe, Bourges, Francija; Slovenski glasbeni dnevi, Unicum, 61. Ljubljana Festival, Ljubljana, Slovenija; Prix Ars Electronica, Linz, Avstria; Florence International Choir Festival, Italija; Auroville film festival 2009 in 2011, Tamil Nadu, Indija; XIII XIII Festival Internacional de Muzica de Sabadell, Španija 2012; Fukushima Vocal Ensemble Competition, Japonska 2013; America Cantat VII, Columbija; Choirs Festival “Enlance coral”, Guatemala City, Guatemala; “Camarissima” International Festival and Cultural Diversity Festival, Mexico City, Pachuca, Hildalgo, Mehika; ICOM/MPR/AVICOM 2013, Rio de Janeiro, Brazilija; International Festival, Theatre Confrontations, Lubin, Poljska 2013; Zuiwerings hal west, Holland Festival, Amsterdam, Nizozemska 2013; Orangerie, Kunstfestspiele Herrenhauser, Hannover, Nemčija 2013; Halles de Schaerbeek, Kunstfestival Brüssel, 2013; Belgija, 2013; Grand Theatre de la Ville de Luxembourg, Luxemburg 2013; Art center, Melburne Festival, Australija 2014; Kaserne Basel, Reithhale, Švica 2014; Svetovni glasbeni dnevi, Slovenija 2015. . . ). Za svoje delo je prejel številne nagrade.